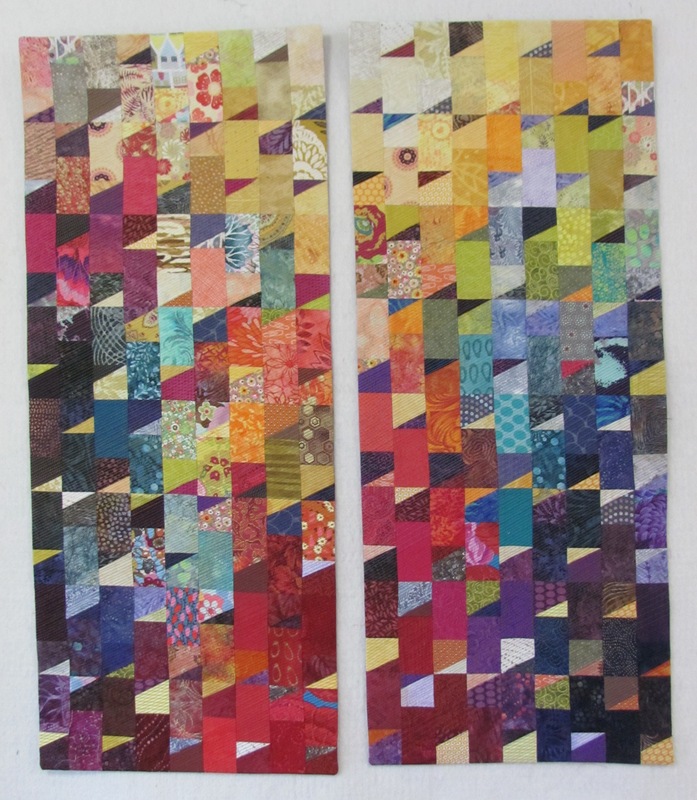 To read the artist’s statement that accompanies each quilt, please scroll down. If the artist’s name is highlighted, that is a link to their website or blog. 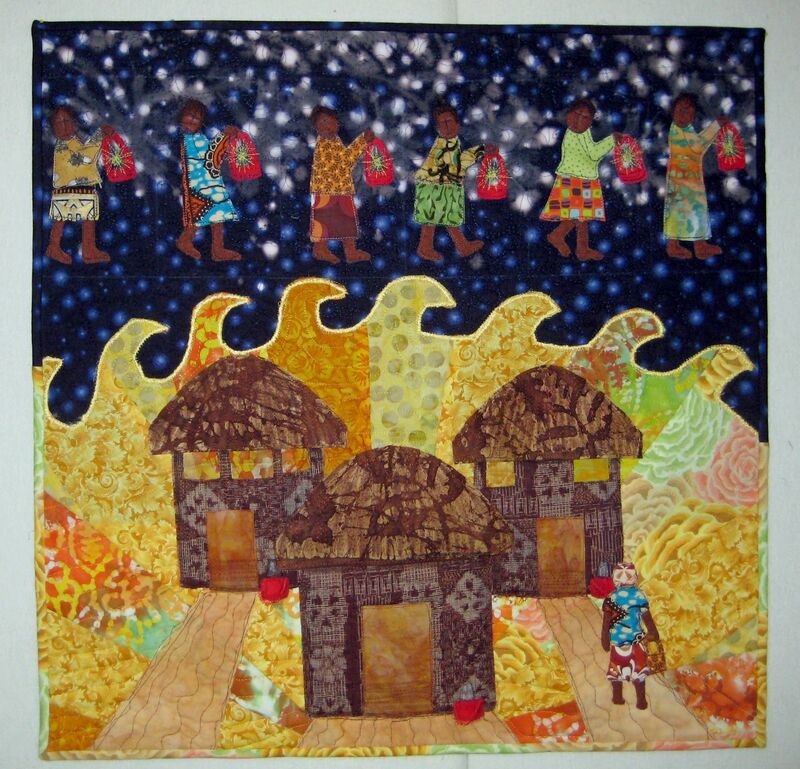 My quilt work portrays the nexus between energy poverty and women, highlighting the neglected nature of this critical issue and the urgent need of universalization of energy service to women in less developed parts of the world. 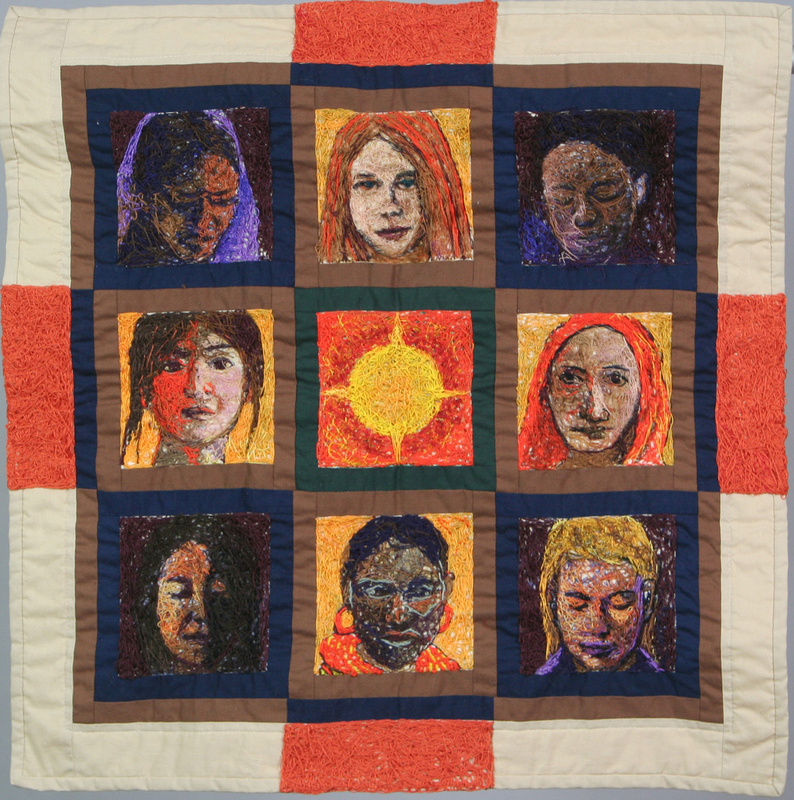 To emphasize the pervasiveness and prevalence of this fundamental problem among women who are always at the receiving ends of energy poverty, I depict eight faces of women who have long remained as voiceless, faceless, and energy-less ones. At the same time, to accentuate the empowering effect of large scale diffusion of energy service on women or developing an affordable alternative energy source such as solar and wind, I put the radiant sun at the center of the work. I use women faces with eyes open as symbols of hope for socio-economic progress of women through utilizing natural resources, securing steady energy sources, recycling, mutual assistance, and education. 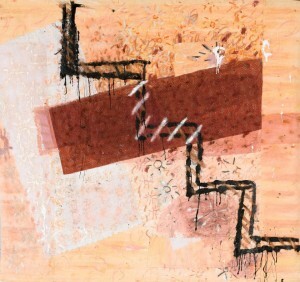 The process of arbitrary wrapping and stitching, which does not differ much from the variety of tedious and repetitive activities that preoccupy women at home, enables me to understand the dynamic creative and inspirational potential of the seemingly trivial and devalued aspects of women’s labors for female artists. 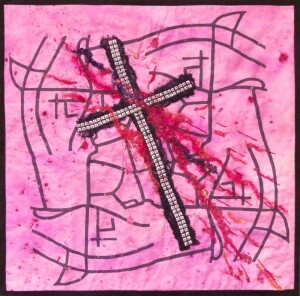 Through the strategic use of stitching that has been traditionally associated with the feminine, I want to show that seemingly ‘menial female work’ can be a source of pleasure and power for women. When I read the title of this year’s challenge: Light, Hope, Opportunity: Empowering Women through Clean Energy, the image of a benevolent sun shining down on all of Africa lit up my mind. On a sunny day, I hang the laundry outside, watch the plants in my vegetable garden grow, and sew next to the window. In Africa, I imagine women enjoying the same sunshine as they work through the chores and joys of each day. Perhaps some are now cooking on solar stoves to give children breakfast before school, or using solar cells to charge cell phones to connect to family, or to light lanterns so children can read and study after dark. Traditional or modern, the sun gives wonderful ways of using clean energy and even a single ray of sunlight can inspire hope. 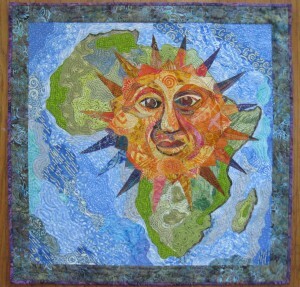 This quilt is an original design from my initial vision of the sun shining down to blanket the whole continent of Africa. It is made using commercially available fabrics, raw edge appliqué and free-motion quilting with rayon and machine quilting cotton thread. For some time I have been interested in learning about micro-enterprise programmes, especially for women in Africa. 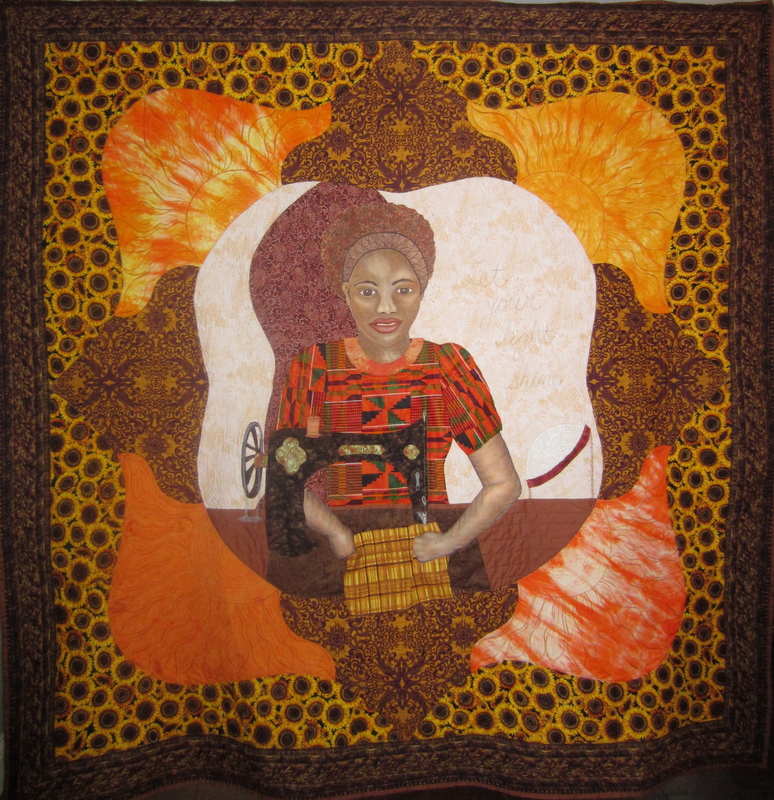 My work was motivated by the question and challenge as to how to illustrate such enterprises via The Art of Quilt. 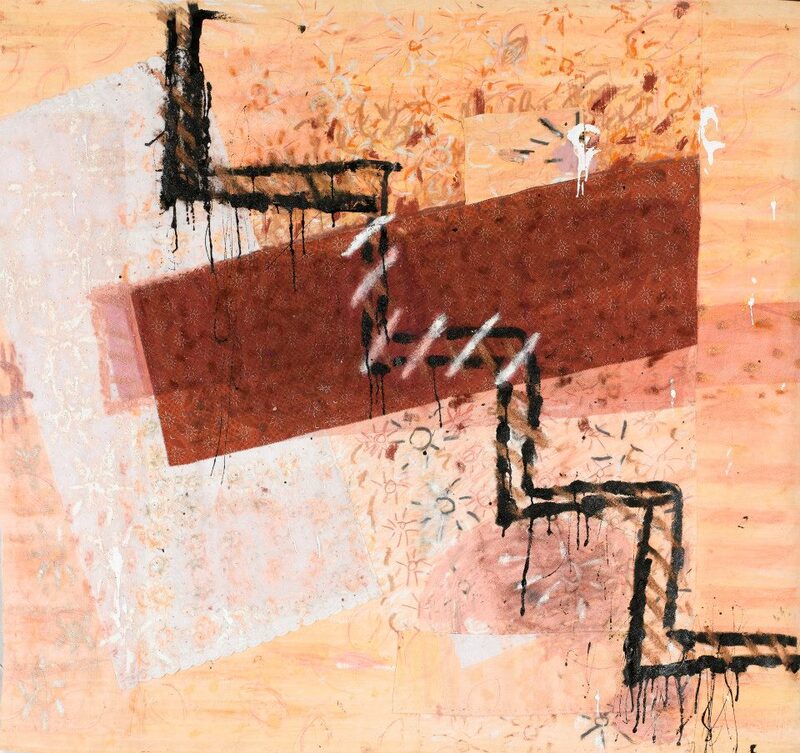 In “Staircase” the background shows shades of brown and ochre reminiscent of arid parts of Africa. The staircase symbolises the ascent and way forward in empowering women through micro-enterprise programmes such as Rhode Island-based Solar Sister. The quilt shows there are bulbs of light scattered around the staircase representing the fruit of solar energy-based projects lighting up the world. 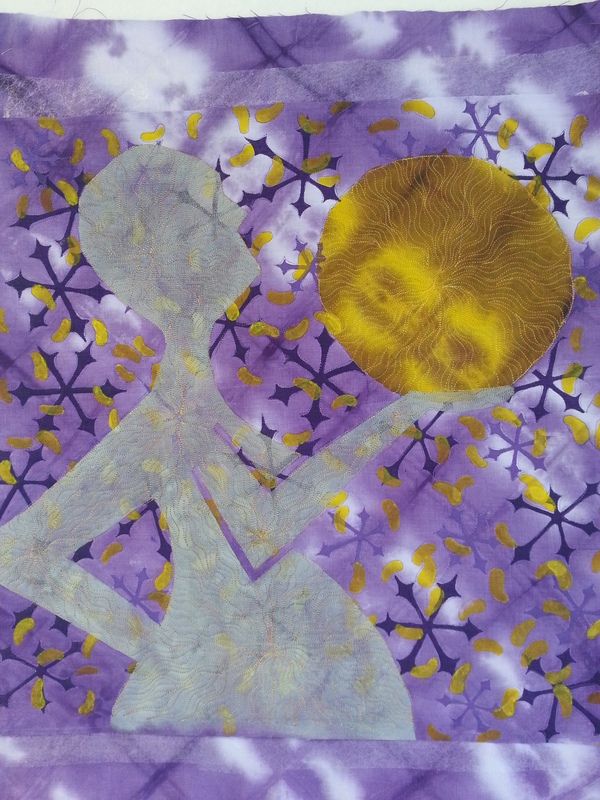 My quilt comprises four layers of textiles combined with painting and hand stitching. Let There Be Light is a quilt based on a photograph taken by Solar Sister. This organization graciously agreed to allow me to use this image in my quilt. I love the look of joy on the woman’s face who is holding a new solar powered light. Her friends and family are near as she experiences electricity at night for the first time. It is amazing that there are still large portions of the world without electricity. Solar powered lights are changing the way people live and is bringing light into their lives. I printed this photograph on Belgian Linen. 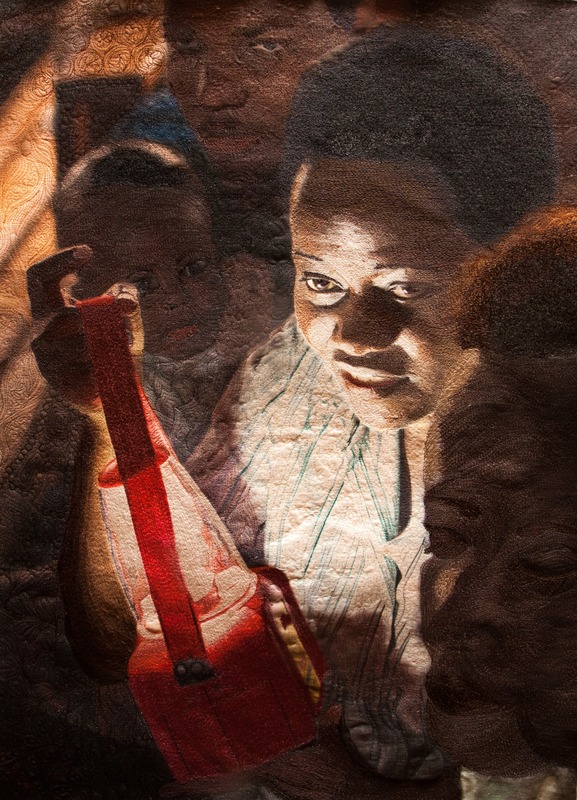 I then covered the woman’s face and the lamp entirely in thread. I used 76 different colors of thread in this work of at. The other faces were brought to life using free motion embroidery. I also used ten techniques of free motion embroidery to finish the background of the quilt. Electricity brings light for reading and learning, safe refrigerated food and clean smokeless cooking. Electricity brings connection to others, through the wider world of TV and computers. Electrical power means power for women to be educated and to improve the lives of their families. Wind power is a way to generate electricity in very remote areas. I wanted to show the connection between wind technology and the light inside the homes, where women keep themselves and their families healthy, well fed and informed. 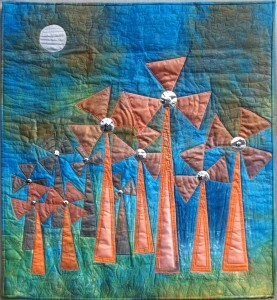 Wind power must be used to create the light and hope for empowering women throughout the globe. The power can be used to provide light for reading and learning, refrigeration, clean electrical cooking as well as a source for connection of TV and computers with the rest of the world. Wind will be an especially important source as it is available day and night, not just when the sun shines. Using this resource, the women in areas of energy poverty will improve their daily life, learning to keep their children healthy and improve the education of the community and thus improving their economic opportunities. 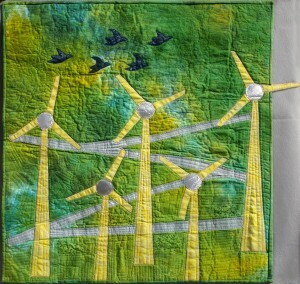 Wind power can be used to generate electricity to empower women throughout the world. The power can be used to provide light for reading and learning, refrigeration, and clean electrical cooking. Once linked to others around the globe, women can have access to limitless information including distance learning. Using this resource, women in areas of energy poverty will improve their daily life, learning to keep their children healthy and improve the education of the community leading in time to improved economic opportunities. Our children are both the light of our lives and our hope for the future. While we in the U.S. turn off lights to save electricity, and worry about conserving energy to protect the planet for our children, on the other side of the world children live in energy poverty. 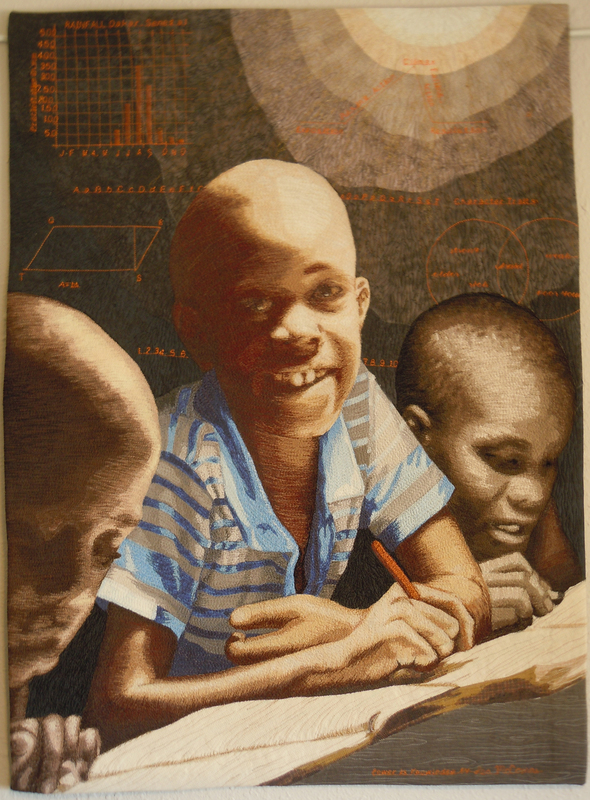 No electricity means no reading or studying at night, which limits their educational opportunities. 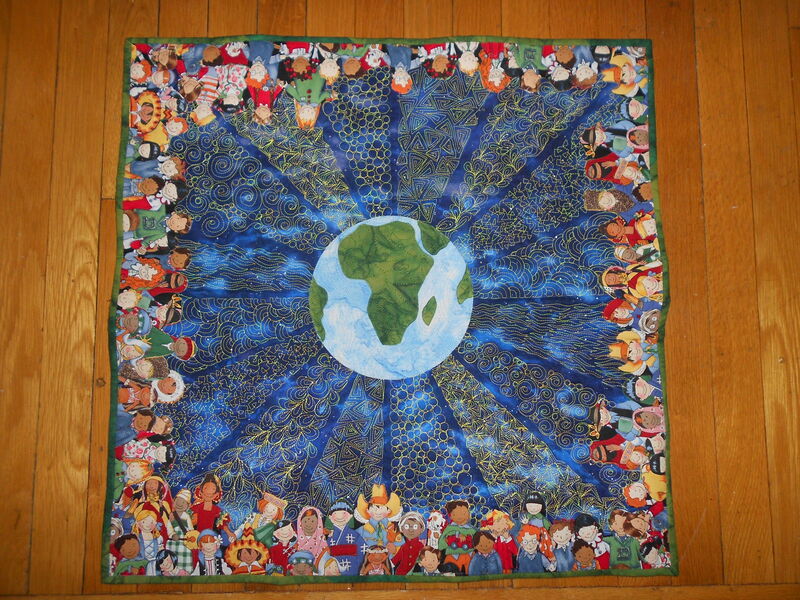 This quilt is my vision of a happy planet with plenty of light and energy for all the children of the world. The aspect of energy poverty we chose to highlight is how the lack of a steady source of power can limit access to education. Without a consistent source of light, it is challenging at best for children to read books for the purpose of doing schoolwork or merely for pleasure. Solar power can mitigate the effects of energy poverty by providing a dependable source of light contributing to greater access to education. 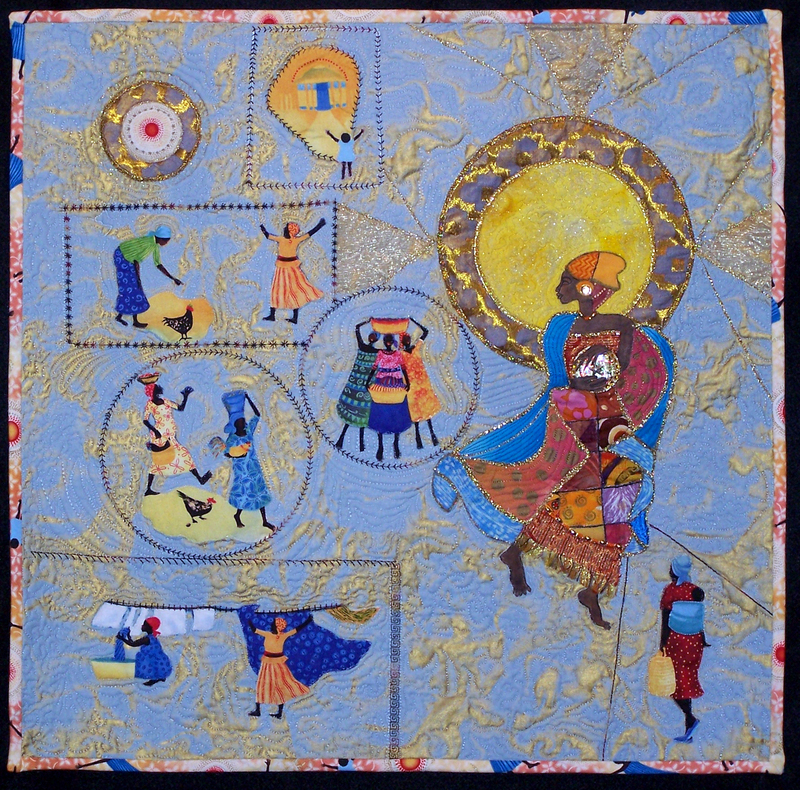 Our quilt consists of a large yellow-gold sun with fabric-collaged rays of sunlight in shades of yellow and blue quilted onto an iridescent “aura.” Like the rays of the sun itself…the fabric rays and decorative quilting extend to every corner of the piece. Printed in a spiral shape onto organza and layered on the surface of the sun sphere is the informational quote, “In one second, our sun provides enough energy to meet the current needs of the entire Earth for 500,000 years” attributed to the Boston Globe, Energy Information Administration; The Guardian Unlimited. In the bottom right corner, there is a small silhouette of a child holding an open book in one hand and an illuminating “Solar Sister” solar lantern in the other. 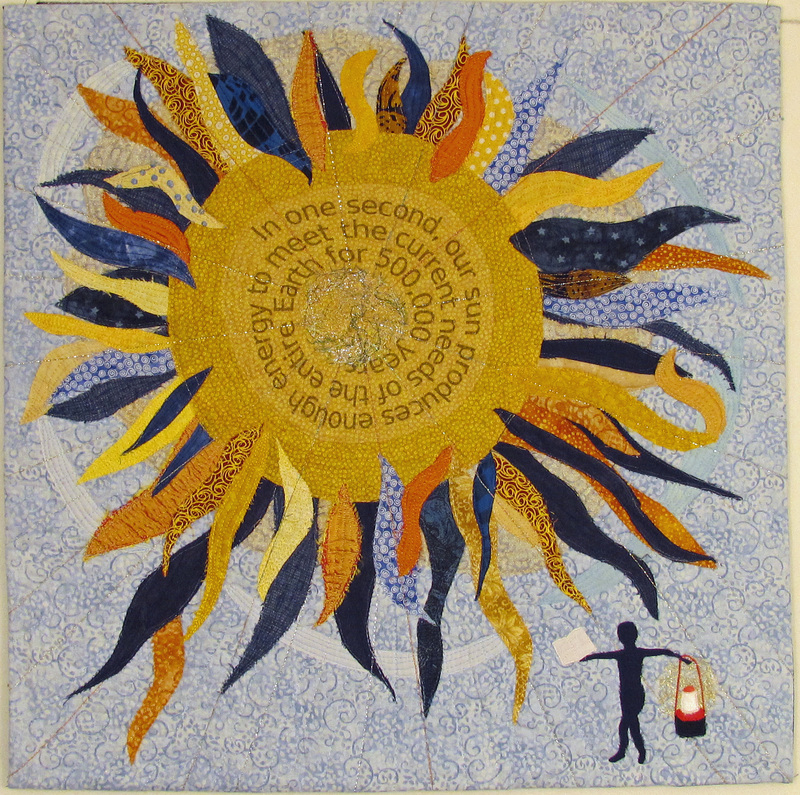 I heard about the challenge “Quilts for Change” from my local Quilting Guild and was inspired by further readings to create “The Giving Circle”. I ran across a commercial fabric that seem to cry out to me to answer the call. 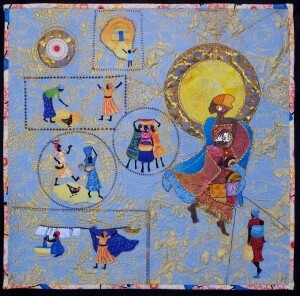 The large figure represents the entrepreneur as she brings her precious gift of light to those in need. It will bring endless benefits for change and opportunity for a brighter future. I have dressed my agent in patchwork and she holds a symbol of expectation in her hands. 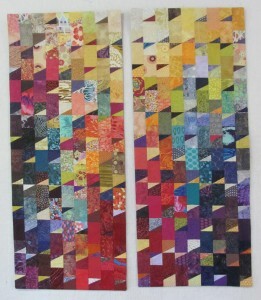 The fabrics are assorted materials machine pieced and assembled along with paint and embellishments. The remaining figures are from the commercial fabric that had attracted me at the beginning. They represent the lives of those who found enhancement through the power of the sun, truly a Giving Circle. Machine appliquéd and free motion quilting In this Story Quilt. 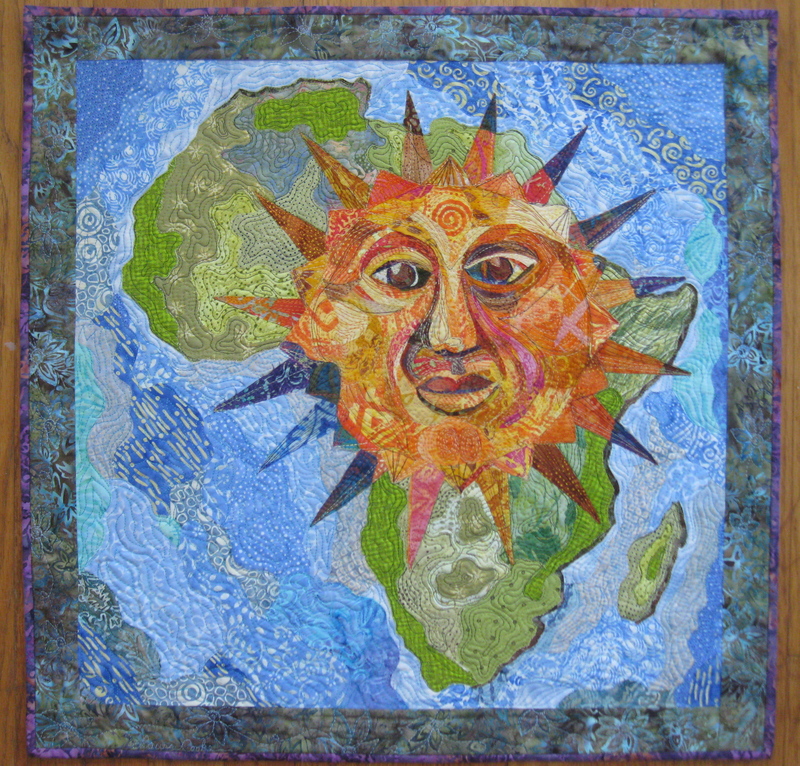 My quilt, “A Brighter Day, A Better World”, is a depiction of a colorful, verdant landscape with the sun shining down, bestowing its warmth and life giving properties. 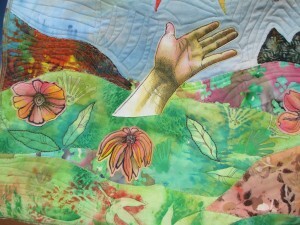 There are hand-drawn leaves, flowers, and rolling hills which include hand painted and commercial machine quilted fabric. 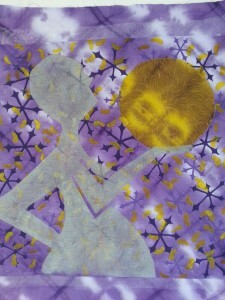 I screen printed and stenciled fabric for the sun and its radiant spokes, which are appliquéd on the hand dyed sky. The focal point, which is in the center of the quilt, is an outstretched hand I drew on fabric with archival ink and water soluble colored pencils. The hand which is reaching toward the sun’s warmth, represents people in third world countries whose lives would blossom with a new prosperity if aided with green energy for light, cooking, and washing. 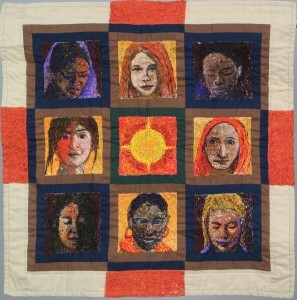 I’m grateful for the opportunity to once again be involved in a Quilt For Change exhibition. I consider myself a citizen of the world, and this is a chance to use my voice to help bring people’s attention to finding the solution to energy poverty. For want of a light the lesson was lost. For want of a lesson the student was lost. For want of a student the teacher was lost. For want of a teacher the school was lost. For want of a school the village was lost. For want of a village a culture was lost. And all for the want of a light. A simple solar lantern has the power to illuminate, not just the simple family home, but the minds of those within. 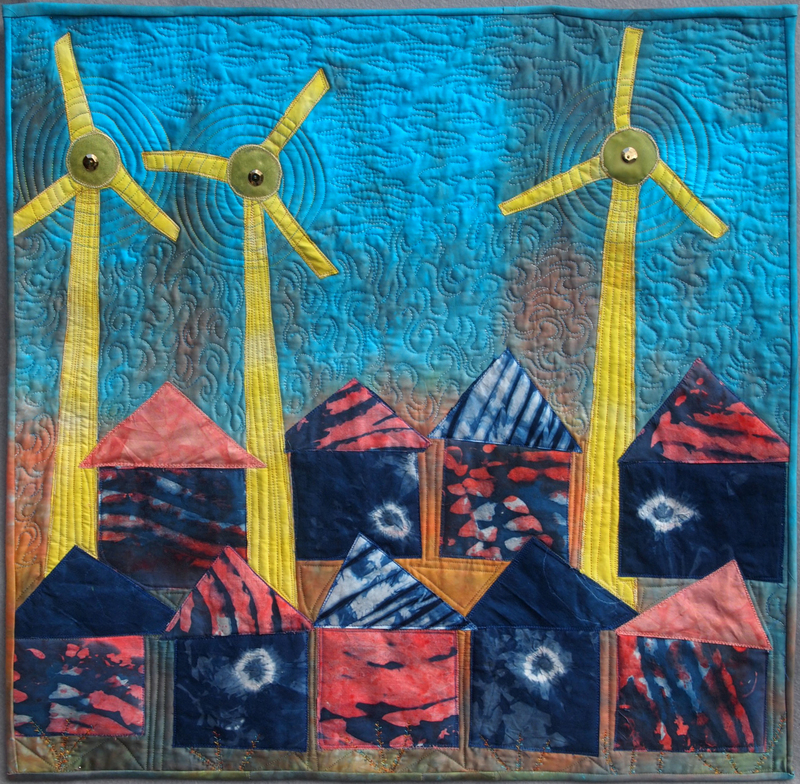 I have named my quilt “A New Day Dawns” as a reminder that each new day brings us closer to having the awareness and the technology to close the gap on Energy Poverty. Solar Energy is the solution to providing not just light but a safe and efficient source of energy for people anywhere in the world. Solar Sister projects empower women with “start-up kits” and training that allow them to directly impact their communities. 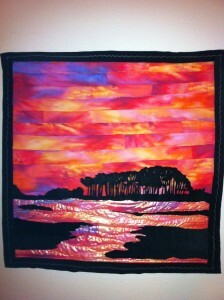 My intention when making the quilt was to honor the sunrise as the universal symbol of hope and light. 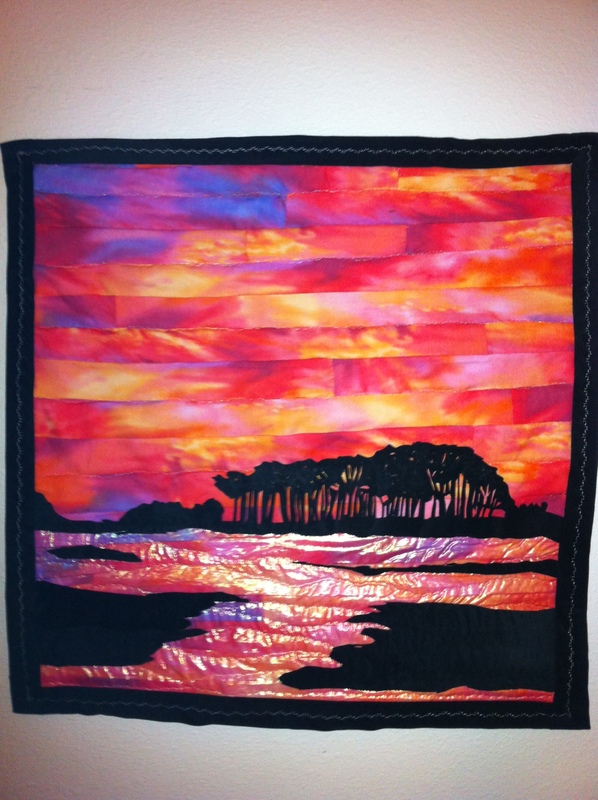 The quilt top was sewn by hand using only the light shining into my workroom window. I used cotton, bamboo batting, synthetic materials for embellishment, iridescent thread, and “solar thread” (which changes color in the sunlight). 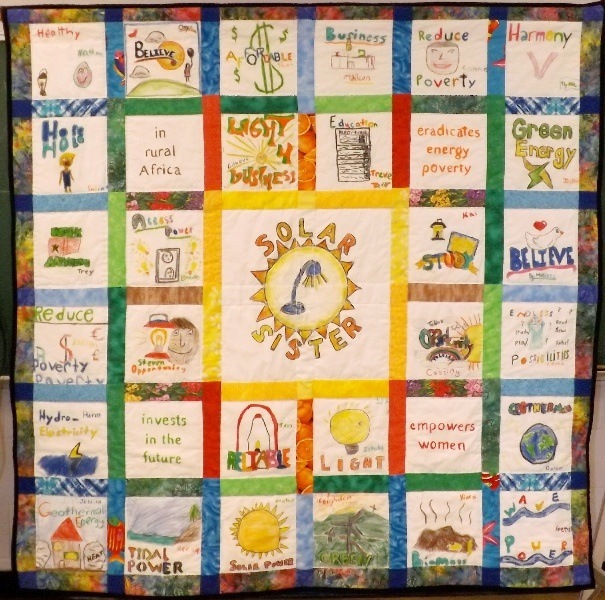 I truly hope this quilt will inspire others to support Solar Sister Entrepreneurs as they spread light to their families and friends. 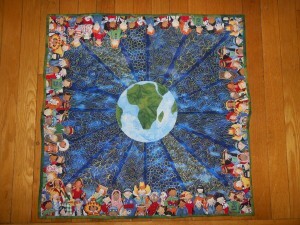 I was really pleased to be involved with this Quilt for Change activity. As a retired teacher I do not have a class of my own, so I “borrowed” Ms. Dionne’s grade 6 class to help me. I think the topic (green energy, equality of women) and process (working as a team, being creative and helping to educate others and therefore improve the world) is beneficial for children’s development as responsible global citizens. The class researched, read and discussed ideas for the quilt. Then each student designed and colored a square to fit with the theme. 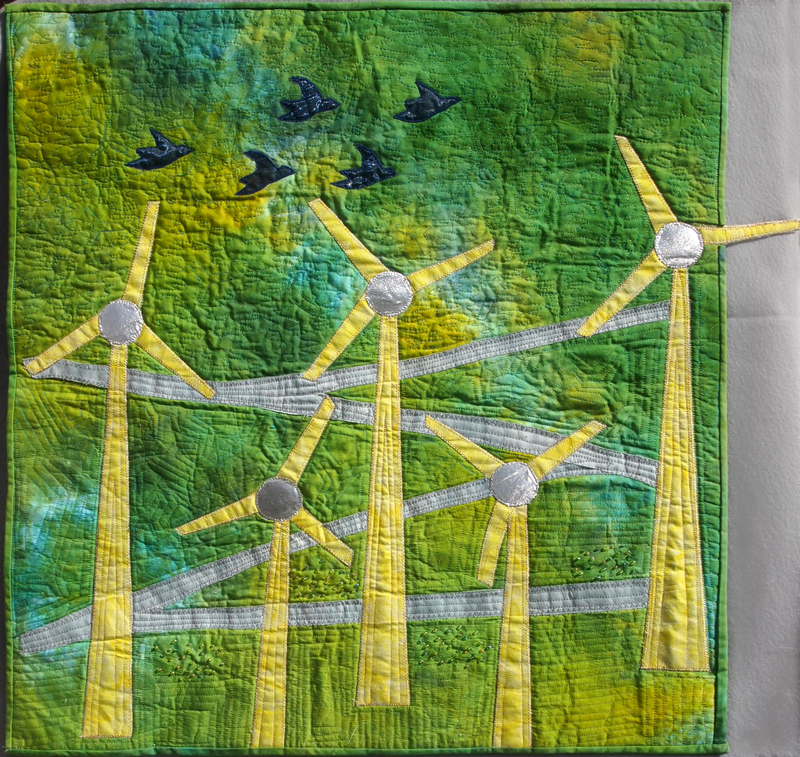 I sewed them together choosing fabric that represented all parts of the environment – plants, animals, earth, sky/air and water. 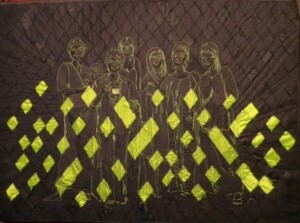 Next, the students hand quilted a square. This whole process was enjoyable and educational for the students. I hope people enjoy looking at the quilt. The appearance of black is merely a sign of the absence of light. Without light, there would be no sight. In researching the works of the Solar Sister non-profit organization I was drawn to a dark and mysterious photograph that simply showed the shadows of a group of women radiating from one small solar light. It made me wonder what things I don’t see because of the darkness. The strength, versatility, and endurance of the woman behind the light made me curious. The unseen, the hope, the wonder, the love that is lost to the darkness; I needed to see more. Radiant chartreuse rays emit light into the pictures that I have seen of solar light sources. These rays illuminate faces, books, families and homes. From afar all that is seen are the bursts of light. When viewed from close range these rays bring into view a life that is full of hope and opportunity. Strips of natural linen and silk fabrics were woven to create a texture to the blackness. Simple lines were drawn with one highly contrasting color. Various shades of black thread were used to create shadows and depth. Small crystals reflect on the most important aspects of the process: the light and the eyes of the women – because without light there would be no sight. Light creates a vision of hope for the future. Can you find all of these words in the quilt? This challenge was designed to raise awareness and to encourage support for the important work being carried out by Solar Sister in Africa! I used 1 inch (2.54 cm) strips of yellow and orange fabric to weave the background. After planning out the word layout on graph paper, I used fabric paint and rubber stamps to add the letters to each square. 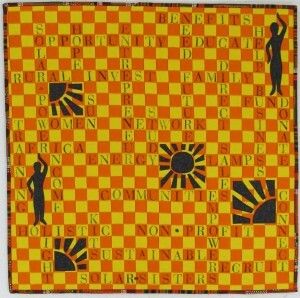 Fusible appliqué women and suns similar to Solar Sister‘s logo were added in some of the spaces between the words. I used a walking foot to quilt the 1 inch grid pattern and finished the quilt with a narrow binding made of an African print. Ruth E. Renkel wrote, “Never fear shadows. They simply mean there’s a light shining somewhere nearby.” When I read that quote, I knew it would be inspiration for this challenge. Through their work, Solar Sister is the light shining literally and figuratively nearby. Much of my work is about color and value. In these pieces, I wanted to show the balance between light and shadow, and how each one enhances the other. The diagonal quilting lines soften the harsh edges of the contrasting light and dark fabrics, while the repetitive pieced rectangles reference solar panels and their industrial grid design. Lucina was the Roman goddess of light and childbirth – she who brings children into the light. Here, Lucina is pregnant and holds a golden orb. The lively color scheme and bright shapes evoke a hopeful spring. This quilt is a tribute to our modern-day Lucinas, our Solar Sisters, who are bringing safe, affordable, sustainable solar powered light to their friends and neighbors. The singed edges of the piece symbolize the dangers of kerosene lanterns, which kill and maim users across Africa each year. 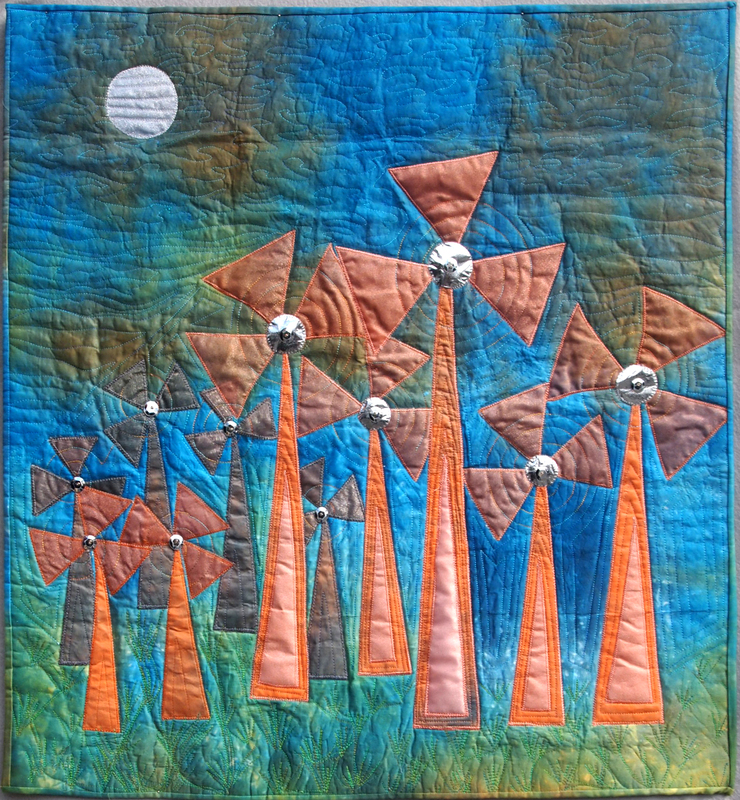 This quilt was made using hand-dyed linen, eco-felt batting, and was hand-printed. The women in Juarez, Mexico, walk alone at night from their places of work (maquiladoras) on usually unpaved roads trying to reach home safely. There are no street lights, no safe public transportation. The electricity in Juarez is used to run the factories, not to help get the workers home, in spite of the dangers. The Sonoran desert would be the ideal location for solar/wind power which could inexpensively and efficiently provide energy desperately needed to illuminate the streets for these women. Hundreds of such women have been raped and murdered; some disappeared. This is all in the service of cheap labor to produce products for international markets. The underlying image of the piece is an abstract I created of a city map of Juarez where it meets the U.S. border. 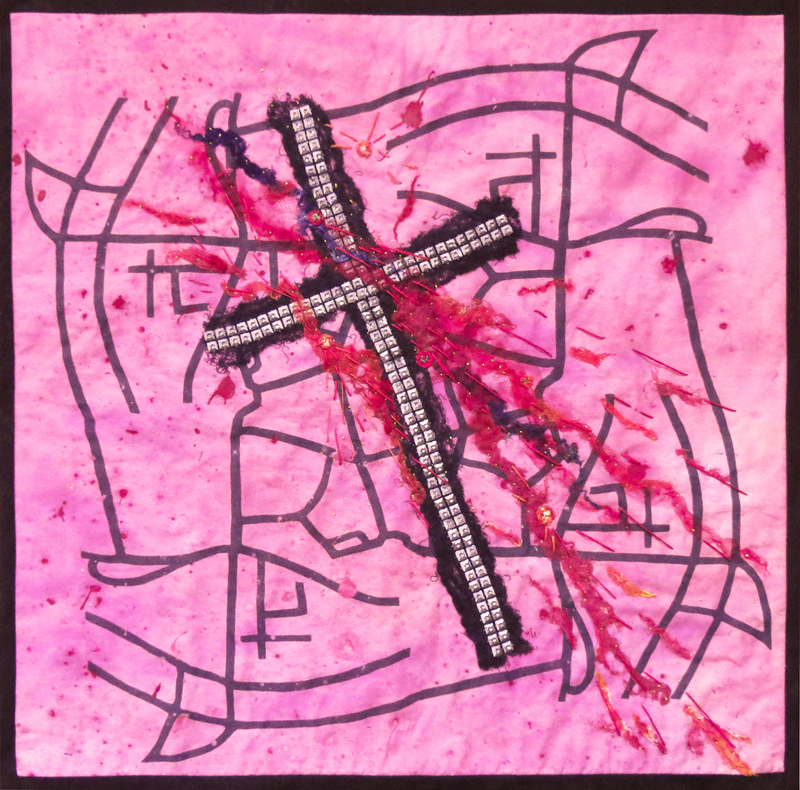 This is the “ground” fabric into which I have appliquéd and stitched the prayers and the blood of the women who have been attacked. When I first met Katherine Lucey, Executive Director of Solar Sister, she told me the story of Teddy the Tailor. Before she purchased a solar light, Teddy Namirembe would walk to the nearby village in Uganda to work at night, leaving her three daughters at home. The simple purchase of a solar light brought so many positive changes to her life and her business – she has extra time to work since she does not have to walk to the village and back and so her income has increased 30 percent. She is safer for not having to make the walk and her children are not alone at home. Her children also share in the use of the light to do their homework. She is not paying for renting a work space or for expensive kerosene and they no longer breathe in the kereosene smoke. Like most women, Teddy turns the extra money she makes (she sews school uniforms) back into her family and her business. As the owner of a small quilting business, I can relate to Teddy. I choose to work at home so I can be available to help my children with their homework and take care of my parents. The hours I have to work after dark, after the work of caring for my family is done, are vitally important to my business. Solar Sister is not only important to the entrepreneurs who sell the lights, but to many others who buy the solar lights and phone chargers as a part of their small business.